Are you on the Instant Pot bandwagon yet? 🙂 If you are, have you tried making yogurt in your Instant Pot? If you haven’t, you should! Instant Pot Yogurt is great. I’ve made homemade yogurt several different ways over the last few years, and homemade Instant Pot yogurt is hands-down my favorite method. There’s very little babysitting involved, and the Instant Pot does a great job of maintaining the temperature for 24 hours, which is something I need since I make 24 hour lactose-free yogurt. If you don’t own an Instant Pot, you should look into getting one. It’s a programmable electric pressure cooker that also works as a rice cooker, slow cooker, yogurt maker and a few other things. You can make amazing, quick meals in the Instant Pot, although I mostly love it for making things like rice, beans and chicken broth. Because of the pressure cooking function, cooking all of these foods in my Instant Pot is WAY faster than doing it on the stovetop. Anyway, back to yogurt. You may be wondering why it’s worth it to make your own yogurt. Personally I have a few different reasons. For one, I can make lactose-free yogurt by culturing my yogurt for 24 hours. I’m lactose intolerant, and can’t eat most commercial yogurt because it’s not cultured for long enough to get rid of all the lactose. Secondly, I like that I have total control over the type of milk that I use. I like to make my yogurt with organic, grass-fed, whole milk. That type of yogurt is pretty rare in grocery stores. You may have a different preference for your yogurt, which is fine because you get to choose whatever milk you want to use. Finally, making your own yogurt usually saves you a significant amount of money over buying commercial yogurt. Homemade yogurt requires a yogurt starter, a blend of bacteria that you add to your milk during the culturing period. You have two main options for yogurt starters: a commercial powdered starter or a small amount of pre-made yogurt, either from storebought yogurt or from a previous batch of homemade yogurt. I like to use this powdered starter for my Instant Pot yogurt. For me, this is mostly due to convenience. I don’t regularly buy storebought yogurt, and in order to use your own yogurt as a starter for the next batch, you need to be making a new batch of yogurt about every week. In this season of my life, I prefer not to be saddled by any more responsibility than I already have. 🙂 Instead, I make a big batch of yogurt and then just make another batch when we run out, which is usually more like once every three or four weeks. If you prefer to use a small amount of yogurt as your starter, you can use any type of commercial yogurt that contains live and active cultures. If you’re committed to trying to use your own homemade yogurt as a starter for each new batch, I’d recommend seeking out a special type of heirloom or reusable yogurt to use as a starter. These yogurts can be used to start new batches indefinitely, as long as you’re consistently making new yogurt every week. For this type of yogurt, I’d recommend purchasing this starter culture from Cultures for Health. I’ve never bought yogurt starter from them before, but I’ve been happy with their milk kefir and water kefir grains and I’m sure they do a great job with yogurt, too. In addition to your Instant Pot, the other required piece of equipment you need is a thermometer, to ensure that you’re adding the yogurt starter at the correct temperature. I use this basic thermometer. I like to make a gallon of yogurt at a time. If you don’t want to make this much, you could easily halve the recipe to make only a half gallon. All of the steps will be the same, although it will take less time for your milk to boil and then cool off. I prefer to use grass-fed whole milk for my yogurt because this type of milk is the most nutrient-dense. You, however, can use whatever type of milk you prefer. You will need some containers to store your yogurt in after it’s finished culturing. I like using wide mouth quart jars. Four of them are perfect for storing a gallon of yogurt. First you need to sterilize your Instant Pot. Add 1-2 cups of water to your Instant Pot. Turn the steam release handle to sealed, hit the steam button and set the time for 1 minute. Your Instant Pot will take a few minutes to come to pressure and then will steam the water for one minute. Once it beeps at you that it's done, do a quick release to release the pressure. After the steam has stopped releasing, open the lid and dump out the water. Add your gallon of milk to the Instant Pot. Turn the steam release handle to sealed. Hit the yogurt button and push the adjust button until the displays says "boil." The Instant Pot will now boil your milk. This usually takes about 45 minutes for me, but may take a little longer or shorter for you. To speed up the cooling process, you can wrap some ice packs around the pot and periodically stir your milk. Cooling the milk usually takes a couple hours for me, but it may take longer or shorter for you. Once your milk has cooled to about 110 degrees, add your yogurt starter. (If you're using a powdered starter (I use this one), follow quantity directions on the box.) Stirring continuously, slowly add your yogurt starter to your milk. Make sure that the starter is thoroughly and evenly mixed throughout the milk. Return your pot to the Instant Pot and put the lid back on. Hit the yogurt button again and then hit the adjust button until it displays a number. This is the number of hours that your yogurt will culture. You can use the “+” and “-” buttons to adjust how long you want your yogurt to culture. Jesse and I are both lactose intolerant, so I ferment my yogurt for 24 hours in order to make a lactose-free yogurt. If you do not have lactose issues, you can ferment your yogurt for a shorter amount of time. I'd suggest starting with 8 hours and then experimenting with longer times if you desire. After you’ve selected the number of hours, your Instant Pot will beep and then display 0:00. It will then start counting up as it cultures. When your yogurt is done culturing, the Instant Pot will beep a final time and then display “yogt.” You can now transfer your yogurt to your preferred storage containers. I like to put my gallon of yogurt into four wide mouth quart jars. Store finished yogurt in the fridge. It should keep for several weeks. Looking for More Fermented Foods Recipes? Be sure to check out my posts on how to make milk kefir, how to make water kefir, and how to make kombucha. If you’re already a kombucha lover, you’ll also enjoy my recipes for strawberry kombucha, raspberry kombucha, and strawberry lemon kombucha! I really would like to try making yogurt in my instant pot but do not have the yogurt feature on mine. Can I manually put in the time and settings? Hi Christina, I don't know! The yogurt feature does NOT use pressure cooking, so I'm not sure how you would do it manually. You could try googling to see if anyone else has solved this problem. Good luck! On step 4, should the vent be set to sealing or venting? Hi Kelly, It should be set to sealing. Sorry about that--I'll go change that now! Do you strain your yogurt? I'm curious to know what the consistency is, when I tried to make yogurt in my instapot I had to strain it in bags and it kind of creeped me out. When I make it on the stove top and pour it into jars (with all the correct temperatures and such) there is an evaporation that takes place because I'm stirring it for about 15 minutes. I just leave it in the jars in a cooler with the water at 110 degrees all night and it's thick and amazing. There is no evaporation in an instapot though so if your yogurt is not runny it must mean the culture is working really well. Hi Erica, I don't strain my yogurt. My daughter and I really like the consistency, but it's probably on the runnier side if you're used to Greek yogurt and the like. I wouldn't describe it as runny, though. I think it just depends on your preference--it's all relative! :) I've read that boiling it an extra time or two at the beginning can make it even thicker; you might try that. Do the quart jars have to be sterilized before the yogurt is added? I do not sterilize my quart jars, although I do always wash them in the dishwasher (which maybe gets them extra clean?). As long as they're very clean before you put the yogurt in them, I personally don't think it's necessary to sterilize them. Meghan, this is my new best friend site! I love your information. I'm going to try yogurt and kefir for the first time!! I usually purchase coconut kefir. Can you tell me how to do that????? Aww, thanks, Ruth! That's so nice to hear. Are you saying that you want to make your own coconut kefir? And is that coconut milk kefir? I haven't written about that, but here's a site with some info: https://wellnessmama.com/54711/coconut-milk-kefir-recipe/ Do you normally drink coconut milk kefir because you're dairy-free? If so, coconut milk kefir may not be the best option for you, as you need to frequently return the grains to dairy milk in order to keep them alive. I know that you can also make your own coconut yogurt, but I haven't tried it myself. If you google you should be able to find some good recipes. I am not lactose intolerant. I just love coconut products. I am going to give it a try - both for the Kefir and the yogurt. The Kefir label actually says "Coconut cream" so I'll be experimenting. Thanks for the encouragement and the website. I will check it out. Great! I hope it works well for you! can you let me know how this goes? I'm especially interested in making coconut yogurt. My friend makes it NOT in an insta pot and it's delicious! She uses a live culture from a coconut yogurt she gets at an asian store. my email is mrsbpianoclass@mac.com. Thanks! Quick question- can I add vanilla and raw honey in the beginning so it's not just plain? Do you ever make it other than plain? Thanks! Yes, but you can vanilla and honey, but NOT in the beginning. Adding those at the beginning could affect the fermentation. I'd add them at the end--either just to each bowl when you eat it, or when you ladle the finished yogurt into your jars. Hope that helps! I just made it following this recipe and it is runny like a heavy milk. Will it thicken in the fridge? I used a gallon of organic milk. 3 packages of yogurt starter. and 8 hour setting. The only thing is the steamer ended on venting. I thought it was sealed. Would it flip over by itself or did I mess it up? Hi Terry, What kind of yogurt starter did you use? When I use the Yogourmet (which I linked to in the post), it takes four packets to make a gallon of yogurt. Each packet is good for fermenting four cups of milk. Did you use Yogourmet, or something else? If it was something else, are you sure you used the correct amount of starter? I speed up the cooling by putting the pot into the kitchen sink filled with a couple inches of cold water. Usually cooled in about 20 minutes! I've made it twice and both times I put the pot in the sink with cold water and added ice cubes. Make dude uou don't get water in your pot. I made it with coconut milk carton and it's super runny, any idea how to thicken it? I've never made this recipe with coconut milk, so I'm not sure! I found a recipe for coconut milk and they literally add gelatin to thicken it at the end. I’m not sure if coconut milk thickens the same way as other milk. Have you ever used almond or rice milk? If so whic j kind is best? I have never used almond or rice milk. You probably could, but you'd have to find a recipe specifically made for those milks. I have been making my yoghurt in the Instapot for ages, but I do the heating of milk on the stove top, I add half a cup of full cream milk powder while hot as we love rich super creamy yoghurt & mix well, cool down to add my starter (I use granules from either online or our local brew shop) & then pour into mason jars and seal. I stand them in the Instapot (no added water, just sit inside) and set as directed for 12-14 hours. Presto yoghurt set beautifully, creamy and tart tasting in jars with no messing about. The Instapot booklet has clear temperature instructions, but I elected to do jars rather than transferring the 'done' yoghurt. Have not had a failure yet! By far the nicest yoghurt we have tried. A word of warning, check the height of your jars in the pot before selecting, the lid needs to fit on the Instapot (remove the underside lid vent filter for more space). I also measure my milk out in my jars before heating, takes the guess work out of the amount of milk to use. I have also done it the exact same prep way but cultured in a cooler with hot water wrapped in a blanket for 12 hours. This works, but it needs a few extra days in the fridge to really thicken up. Thanks for posting -I am following the Specific Carbohydrate Diet and the yogurt must be fermented at temp between 100-110F for 24 hours. 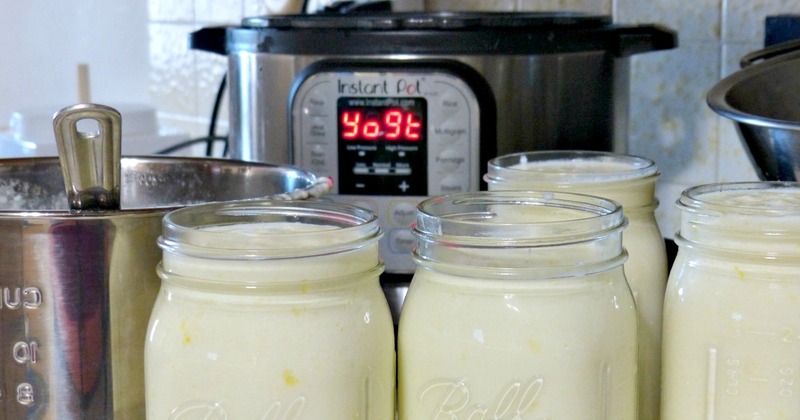 Would you know the fermenting temp for making yogurt in the Instant Pot? I'm not sure what the fermenting temperature is. For what it's worth, though, I am very sensitive to lactose and this yogurt causes no issues for me. I think it's made in an SCD-compliant way that removes all the lactose. Hi Meghan, In Step 9 when you culture the yogurt for 24 hours, do you turn the steam release handle to Sealing or Venting? Above you mentioned that the yogurt setting does NOT use pressure cooking. However, on the Quick Reference Guide that came with my Instant Pot (which seems to be the same one as your picture), it mentions to use Steam Release Sealing when using the Yogurt feature. Can you please clarify what you do? Yes, you can do that! I haven't tried it personally but I'm sure you can find directions online. I think you can't make a full gallon, which is why I haven't tried it. I made yoga re like the video ( sorry it was a different video ),'i used he organic plain yogurt, but it never thickened? What did I do wrong? I so hot that I followed the recipe to a T ? Hmm. I'm not sure. I've never had this recipe fail for me. How much yogurt did you use as your starter? Did it still not thicken up even after putting it in the fridge? My yogurt usually seems pretty thin when it first finishes, but then it thickens up a lot after a day or two in the fridge. I'm happy having the same issue. I am putting mine in the fridge to see how it responds but otherwise idk what I did wrong. I'm not sure what's going on. I've made this recipe dozens of times and it always turns out great for me. Have you tried using different types of yogurts (or powdered starters) for your starter? It could be that the yogurt culture you're using just makes a thinner yogurt. So disappointed. :( I used the same starter (2 packets) and 1/2 gallon (store brand) whole milk. Followed the settings to the T (24 hours) and it came out super runny. I tried straining in a nut milk bag, but it ran right through. I've put it in glass jars in the fridge, but it's so runny I don't have high hopes. I may have to sweeten it and drink it so it won't go to waste. Any ideas?? Me again...think I may have figured it out? I saw on a FB IP community that someone asked about her fermenting being on low instead of medium. I had noticed it on low, but not having done this and the recipe not saying so didn't think much about it. I'm assuming it didn't get warm enough to ferment properly. I'm maybe wrong, but I'll try again with it on medium and see what happens. My yogurt often gets a lot thicker after chilling in the fridge overnight. If you're expecting Greek yogurt, it's never going to be that thick, but I definitely wouldn't describe it as runny. Regarding yogurt starter: I bought yogurt at the store for my first round of home made yogurt. I used a couple of tablespoons then froze the rest in tablespoon sized globs. Every third or fourth time I make yogurt I freeze a few blobs to use in future yogurt. The blobs just need to be thawed and tempered and they are good to go. This looks amazing and I cannot wait to try it. I have 2 questions- 1) If I use chocolate milk will it work and make chocolate yogurt? 2) Will this recipe work with almond milk? Vanilla almond milk? Thanks! Thank you so much for this recipe. I do have a question. During the culturing process, does it matter if the setting is set to "less" or "normal"? What's the difference? I'm not sure what you're referring to with "less" or "normal." On my Instant Pot, I only have to select how many hours I want the yogurt to culture for. Can you elaborate? The other recipes I have seen and the instructions on Instapot say to use normal for yogurt and less for sweet rice. I have the same problem... waited 8 hours and nothing happened lol. Lols so good and so easy! How do I make it flavored? My kids love strawberry, banana, and vanilla. I’m guessing at the end? I've never actually flavored it, but if you want to then I would definitely do it at the end and not sooner. We just add frozen berries and any other toppings to our bowls right before eating. Hi I made this yesterday. It was the consistency of a really thick milk. I put it in the fridge overnight and it didn't thicken at all. It tastes wonderful but is too soupy to eat as a yogurt! I used half a cup of stoneyfield organic whole milk yogurt as my starter. What did I do wrong and can I save it? Maybe by straining? This is my first time trying yogurt so not sure what to do! You don't indicate how much yogurt starter is needed for 1 gallon of milk. I just ordered the three-pack that you suggested. Will that be enough for one batch, or will I be modifying the amount of milk? Thanks so much! I can't wait to try it! Hi There! I’m looking forward to trying your recipe. Question though, you said that you ferment it for 24 hours? I too need to make lactose free yogurt but I was using lactose free milk. Can you please explain how the 24hr ferment kills the lactose? Thank you!! Hi Susan, The bacteria in the starter consume the lactose as part of the fermentation process. If you give them 24 hours to work, they will eat up virtually all of the lactose in the milk. What if I missed the window and cooled the milk too much after boiling it. Can instant over? Yes, I think that would be fine! Just don't boil it again after adding your starter, as that high temperature would kill the starter. just wondering if I could use Almond milk with the starter? I would definitely not use almond milk in this recipe. You may be able to make your own almond milk yogurt (I've never tried it), but I would go find a recipe that's specifically designed to use almond milk. I've since seen a few recipes using almond milk but they require other ingredients that I don't care to use. I will be trying this recipe soon. Thanks for responding. Hey guys. I don't know if it's possible but it seems like I'm having problems with milk now. I don't know if it's all the junk they put in milk like hormones and antibiotics, but I can't drink milk. It's too bad because I enjoy yogurt and know it's good for you. I'm glad I found this Instapot recipe because I love cooking and didn't know you could make your own yogurt. Can't wait to see how this turns out. Wondering why a longer hold time renders the yogurt lactose free? Also, can this recipe be used to create Greek Yogurt? The fermentation process consumes the lactose in the milk. A longer fermentation time (or hold time, as you called it), will remove more of the lactose. 24 hours will remove virtually all of the lactose. I have never tried this myself, but you should be able to strain your yogurt to make Greek yogurt. Please clarify that if you choose the default Instant Pot 24:00 setting, it is on low and will not work. I choose the 8:00 normal setting and add hours to get to 24. Best yogurt EVER! Set up perfectly and you could smell the tanginess immediately after removing the lid. My ex in the early 80s was from the middle east and I've made homemade yogurt for 30 years on the stove top, cooled it down, added starter and wrapped the pot in a blanket for 24 hours and left it completely undisturbed. This has a wonderful tangy smell and I'm looking forward to digging in later this morning. Thank you!! For those asking about almond milk yogurt, I've used this recipe with my old yogurt maker, but not yet with my instant pot. It has corn starch for thickening, much better than gelatin, which is an animal product... http://afairytalecomesalive.blogspot.com/2013/04/recipe-almond-milk-yogurt.html Thanks for posting the 1-gallon instant pot directions for dairy milk. Other recipes I found were 1/2 gallon and I wanted to make sure 1-gallon was doable. It worked like a charm. I'm especially pleased to see directions indicating that it's good to leave it in the pot longer, had worried about whether I had to pay close attention to the time. Thanks again! So disappointed ! I followed the instructions and, like some others have written, my 24 hour yogurt is as runny as half and half. I tried putting it in a yogurt straining bag but it went right through like proper liquid. I read that I can try reheating it to 110 and then incubating again. I'm in the process of doing that and trying it in the oven even though my oven doesn't have a setting that's low enough. When I set the incubating time on the instant pot, I set it to "normal" and 24 hours. I wish I knew what the heat setting was but I don't see any way to find out. So disappointed. Any thoughts and suggestions would be welcome. Ah, good question! The Instant Pot is my current favorite way. :) That dehydrator article was written several years ago, before I had an Instant Pot. I should go update that. I personally find the Instant Pot much easier than my old dehydrator method. Thanks for pointing that out!